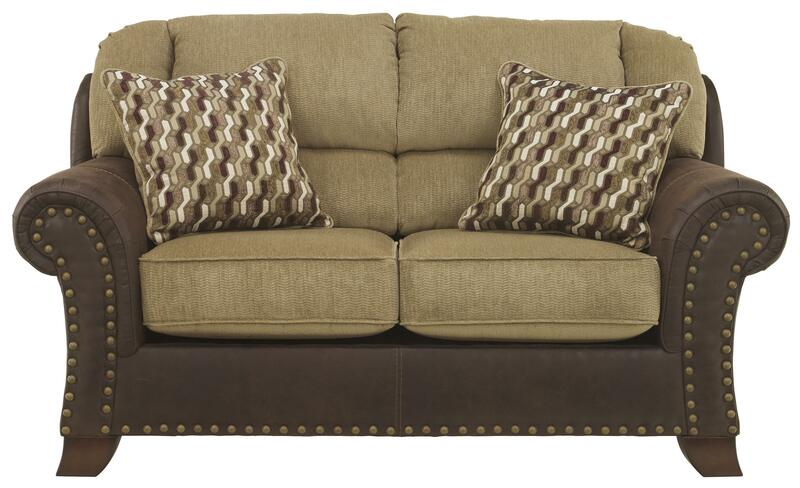 You can have a great look as well as style for your living room with this loveseat. Plush seat cushions and a divided bustle back in chenille fabric makes for cozy seating. 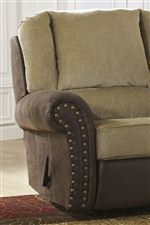 Faux leather covers the rolled arms with nailhead trim, sides, and lower rail of the loveseat for a two-tone contrast. Two accent pillows with a geometric fabric on one side complete the loveseat. The Vandive Two-Tone Loveseat with Chenille Fabric/Faux Leather Upholstery by Benchcraft at Michael's Furniture Warehouse in the San Fernando & Los Angeles area. Product availability may vary. Contact us for the most current availability on this product. Soft textured chenille fabric in the seating areas with faux leather on the arms and sides brings unique style to this upholstery collection. 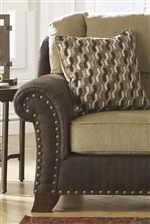 Deep bustle backs provides supportive comfort to each piece, while rolled arms with nailhead trim add a sense of classic elegance. The Vandive collection is a great option if you are looking for Transitional furniture in the San Fernando & Los Angeles area. Browse other items in the Vandive collection from Michael's Furniture Warehouse in the San Fernando & Los Angeles area.